January 16, 2018 | -by: Kevin George. This is a mantra that turns the wheels of marketing all around the globe. It takes an average person 0.05 seconds to make an impression and the product being marketed, needs to make well of this time period. Email marketers tend to experiment with the subject line and pre-header text to boost open rates but once the subscriber opens the email, what they do next relies heavily on the design. In the above email, even before you read the words in the email, your attention immediately falls on the bright scenery and the blue color standing out against the sea of lavender and mild yellow. Next, you notice the subtle animation of the flowers gently moving on either side of the image, and as you move ahead, while you skim across the text, your eye scan path is diverted towards the bright colored CTA buttons. This is how important design is to email marketing and more importantly, how colors play a role in improving email engagement. Adding colors to your emails doesn’t mean slapping any random colors from the visible part of the color spectrum and making it work. Designers make use of different color schemes for choosing the appropriate colors for an email. 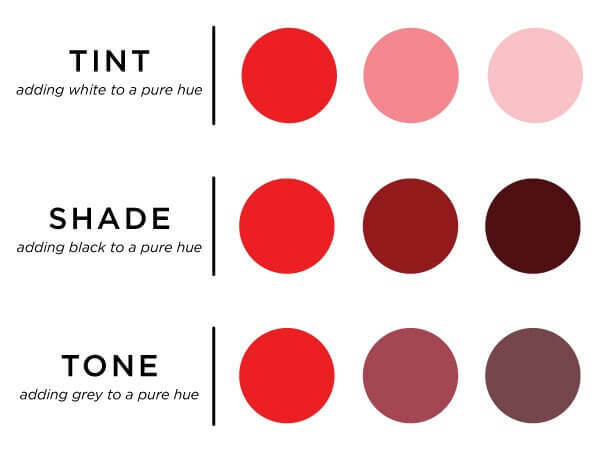 Choosing a color scheme starts with choosing a base color (generally brand color) and the secondary (and tertiary) color is chosen based on the base color. Achromatic Color Scheme: Derived from the Greek word ‘chroma’, achromatic roughly translates into ‘devoid of color’ i.e. Black and White color scheme. In this kind of color scheme, white text is used over a black background to create an artistic effect as well as clean and professional look. In this email by Samsung, a white CTA button stands contrasting to the black background in the top half which gives an impression of elegance. Monochromatic Color Schemes: As the word suggests, this color scheme has one main hue and variations of the same. Even though this lacks contrast, the monochromatic color scheme provides a clean and polished image. 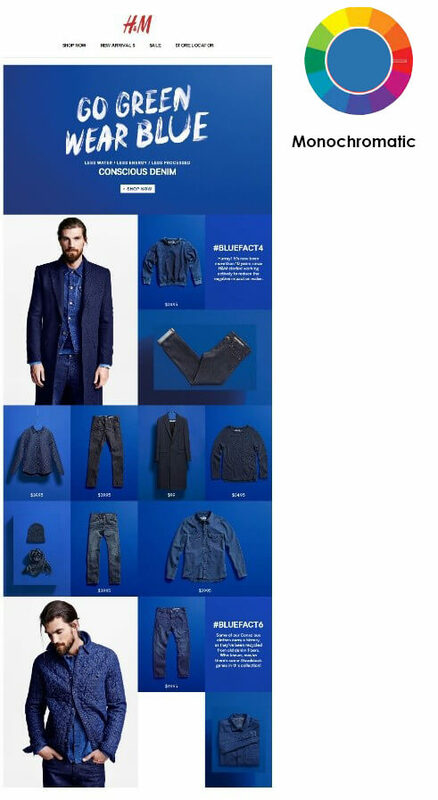 As soon as you view this email by H&M, you are greeted by shades of Royal blue which has an overall calming effect on the subscribers. Analogous Color Scheme: In this color scheme, the secondary color is any color that is placed directly next to base color in the color wheel. Owing to the colors being next to each other, the resultant design shall have a non-contrasting, softer feel. In this email by Code School, the use of green in the CTA button does not make it stand out much but the color still manages to catch the subscribers’ attention. Complementary and Triadic Color Schemes: Using two different colors from opposing sides of a color wheel generates a contrasting effect and such a color scheme is called Complementary color scheme. When you use three colors that are equidistant from each other in the color wheel, it is called a Triadic Color scheme. 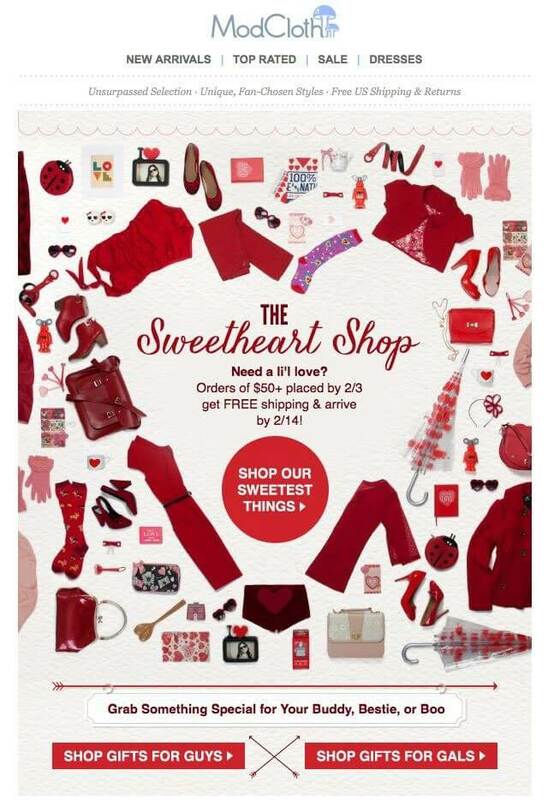 Red and blue colors have been used in the background as well as in the email elements. Although there is a sharp contrast, each section is evident. Every brand has its fixed set of branding guidelines, in which colors are also specified. There are 2 reasons behind brands using signature colors. To evoke different moods, hot/cold response, and ‘visual stimulation”. Our brain is hard-coded to respond in certain ways to viewing certain colors. Yellow is associated with sunlight and triggers warm and happy feelings. Red is the color of passion and automatically increases the heartbeat. Green is the color of the ocean and triggers a feeling of serenity and calmness. Shades, tints, and tones also contribute to evoking emotions. While red is associated with rage, anger, and blood, pink which is a tint of red, evokes emotions associated with love and romance. When sending an email to your global audience, it is important to remember that different colors hold different significance in different cultures. 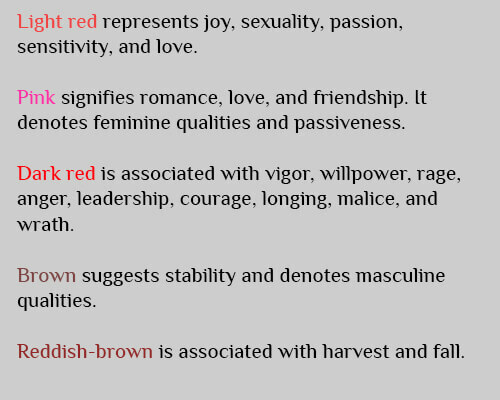 Red is a color for celebrations, good luck in China and death and afterlife in the Celtic community. Black is associated with funerals, death, and evil in western countries and is a symbol of income, success, and power in Feng Shui philosophy. You can learn more about it, here. Women, in general, possess one extra photopigment in their eyes and this enables them to distinguish colors in a color spectrum more efficiently than men. Although this doesn’t affect the color of CTA your email should have, it plays a role in what colors attract which gender. 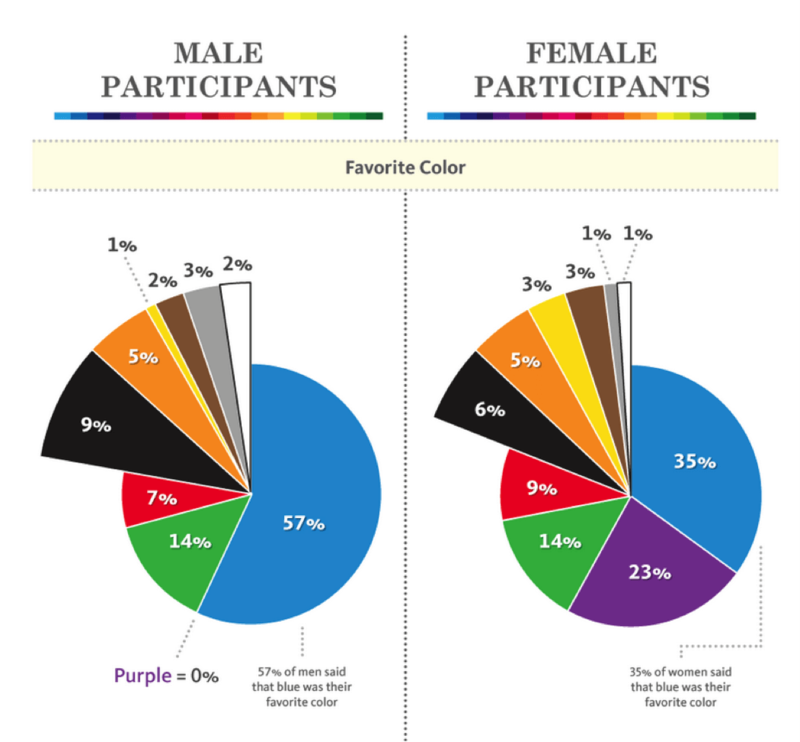 A study by Joe Hallock has cited that majority of men (57%) and women (35%) picked blue as their favorite color. Additionally, an observation by KissMetrics shows that a huge number of females also likes the color purple. Each season is associated with dedicated colors. 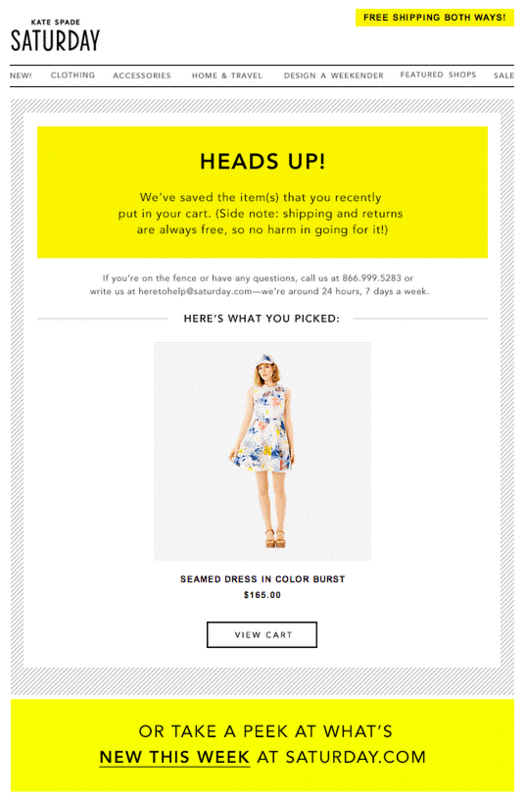 Many email developers include certain colors in their emails based on the ongoing season. Summer: Summers is one of the most awaited seasons for many marketers. With bright sunny colors like yellow, orange, green and blues up for display, marketers bag on targeting beachwear, holiday packages, summer attires and more. Monsoon: This is the season that sparks the love for a good shower. While solid colors like blue, brown, grey and white dominate the emails during this time, it’s also a great time for bright colors that STAND OUT. You can read more about the influence of seasons on your email in our blog “Seasonal Email Templates: Add Hues To Your Email Campaign” and how certain holidays have their unique identifiable colors in “Right Colors for your Holiday Emails”. Spam filters by most ISPs hate flashy emails. Bold colors such as red and green, when used to highlight certain email sections, trigger these traps. You can avoid such pitfalls if you are aware of the Things to look out in Email Design. Is it any seasonal or festival-oriented email which has an associated color palette? Stay tuned to our blogs for more such email marketing tips.